LG 22LU5000 review | What Hi-Fi? 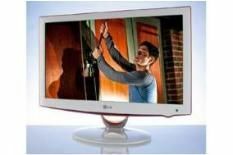 LG has taken the opportunity to make a small TV look cute without appearing frivolous. The 22LU5000 is curvy, multicoloured and sports an attractive, jewel-like stand. It's not all whimsy, though: a 1920 x 1080 resolution and a brace of HDMI inputs mean the LG's equipped to see second-room service from any source(s), and it benefits from excellent on-screen menus as well as logical remote control. Sporting a Full HD 1080p resolution, the LU5000 delivers vital, energetic pictures when using Blu-ray as a source. The excellent new BD remaster of Dawn of the Dead enjoys strong contrasts, an extensive, poised colour palette and impressive detail levels. The LG does good work with dark scenes and with motion too, though very complex patterns (a fetching plaid shirt as worn by a grimacing zombie, for example) can provoke shimmering. DVD content generally looks assured, too. Most of the Blu-ray performance plusses (convincing colours, bold contrasts) are present. Detail is good, although the picture is softened, slightly, and the 'LU5000 can't deal with movement with the same authority as with HD material. But that's to be expected. And with digital TV broadcasts, the LG's picture is detailed and vivid, with deep black tones and quite impressive edge definition. And when playing games, there's no discernible 'button lag'. The sound is reasonable by the standards of the class, though nothing to write home about. But, in pure picture terms, the 22LU5000 has an awful lot to recommend it.